When I was an active storyteller, I loved to tell one of the best known legends of Wales. 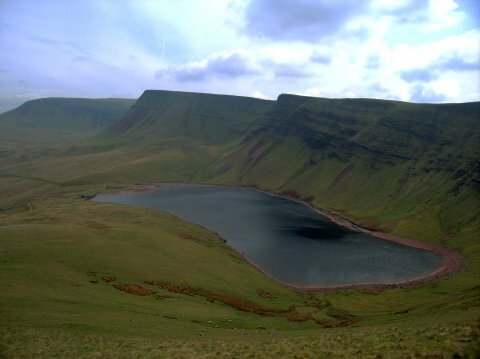 It’s found in many collections under various names, most often, “The Bride of Llyn y Fan Fach.” Variations of this story are found all over the world. A mortal man marries an Otherworld woman who breaks his heart, but sometimes brings marvelous children into the world. I’ve started to write about this legend on other occasions, discarding drafts that rapidly grew beyond the scope of a blog post or two or three. What prompted me to begin again was a visit to Barnes & Noble. Barnes & Noble knows what sells. An entire row is now filled with “Paranormal Romance.” The covers feature illustrations of winsome teenage girls. The genre isn’t new; Charles de Lint, a Canadian author, has written stories like this for thirty years. The popularity is new, and almost all of today’s novels invert the usual folklore setup, in which a mortal man meets a fairy woman. Not only that, but the odds of a happy ending in these tales are worse than the chance of hitting a single number at roulette. The Swan Maiden is the most widespread “mixed marriage” type of folktale. It is also considered the most primitive, since the Otherworld woman’s native form isn’t human. Usually it’s a bird. Swan maiden stories are found all over Europe, as well as the middle east, Russia, India, China, and Japan. There’s a parallel water buffalo woman story in Africa. According to one researcher, the motif is 30,000 – 40,000 years old, as shown by a bison-woman cave painting. In swan maiden tales, a man sees a flock of swans glide to earth at night. Removing their swan robes, they change into beautiful women who bathe or dance together. Enamored of one in particular, the man takes her robe so she won’t fly away, and eventually persuades her to marry him. Later they have children. One day the swan-wife hears her children sing of where her husband has hidden the robe, or they tell their mother when they see her in tears. The swan maiden puts on her robe and flies away forever, leaving the children with their father. At the end of the 12th century, a young man lived with his mother, a war widow, in Carmarthensire in Wales. Every day he drove their small flock of cattle to the lonely tarn known as Llyn y Fan Fach. The cows preferred the grass there to any other pasture. One morning, the man (who isn’t named in the tale) beheld a beautiful woman sitting on the water combing her hair. All he had to offer was a bit of bread, but he walked to the shore and held it out. She glided over the water and said, “Hard baked is thy bread. Hard am I to hold.” Then she dove under the waves. The third time, the bread was just right. The lady gave her assent and her father offered a sizable dowry of cattle, goats, and horses, after the young man agreed to one condition – his wife would leave him if he struck her three blows without cause. In time, they became the personal physicians of the Prince of South Wales. 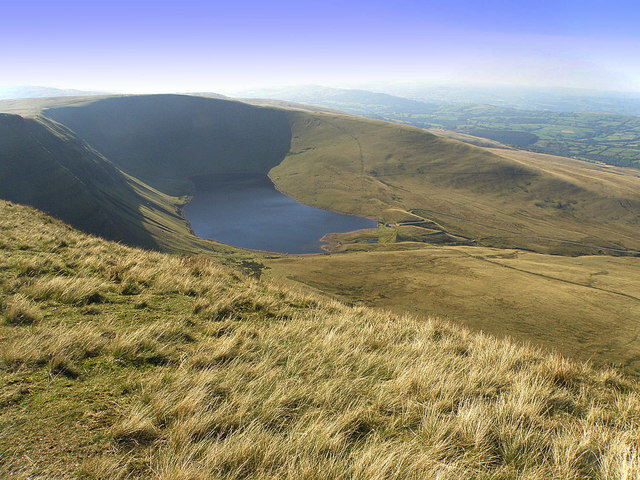 The legend of the Bride of Llyn y Fan Fach comes from a book called The Physicians of Myddvai, 1861, by a Welsh printer named Rees. The Welsh Historical Society has herbal recipes attributed to the lake woman’s descendants, and the last of the line, Dr. C. Rice Williams lived into the 1890’s. What do we make of a story like this? First, we can recall Marie-Louise Von Franz’s comparison of myth and folklore. The great myths and legends tend to be more polished. Their plots are coherent enough to satisfy modern demands. In contrast, folktales are more primal and more opaque. One unique feature of this tale is the specificity of location and the lake lady’s descendants. Greek families traced their ancestry to the heroes of Troy, and my mother had a coat of arms dating back to the Normal Conquest. A similar dynamic is one explanation for the unique segue of this fairy tale into history. The real mystery for me has always been, why is the husband is doomed from the start? Who would count a shoulder tap as a “blow?” Why do mortals never win when they give themselves to Otherworld lovers? I’ve asked myself why since the day I found a book of local fairytales in a used bookstore in Wales on a visit 20 years ago. Though I don’t have certain answers, I have some thoughts which I will offer next time. Meanwhile, does anyone else have any ideas? Why would the girl’s father set an impossible condition, and why would she actually leave over such a minor slight when the text says she really loves her husband? I welcome any suggestions you may have. This entry was posted in Fantasy, Myth, oral tradition, Stories and tagged Fairytales, fantasy, folklore, Myth, stories. Bookmark the permalink. Perhaps the Celts tell these tales of ephemeral harmony with nature as a reminder that mortals must live with unfairness and that abrupt change is nearly all you can be sure will happen to your world. That’s a great summary of what I’m thinking. Want to write the next part for me? If you are offering to take over my grading for a night while I do it, oh boy! Yes, please! In the Irish version, the seal-woman’s seal coat is hidden by her husband until one day she finds it and goes back out into the sea. It’s so fascinating how these stories have a common thread no matter where they turn up! You’re right! I don’t know Irish stories as well as Scottish and Welsh, so I forgot the selkies, but now I remember Roan Inish and enjoying the movie very much. I like birth of religion stories, for some reason. They are so very improbable. I’ve also heard that Oisin passed into the west, to Tir na Nog, with Niamh, a fairy woman. After what seemed to him like three years, he asked to visit Ireland again. Reluctantly, Niamh gave into his request. In truth, 300 years had gone by in the mortal lands, and no one knew him. Sadly, he turned to go home, but reached down to help a farmer who was trying to move a boulder from his field, for the men in those times had grown small and puny. Unfortunately, the saddle girth broke, and Oisin fell. The moment he touched Irish soil, those 300 years fell upon him. Men carried him to a nearby monastery where St. Patrick sat with the ancient hero, and listened to the tales of old Ireland and the Fenian men. I had forgotten that story, but there is one where a mortal man doesn’t do too badly with an Otherworld lover. He got to spend three years – or three hundred – in the land of the ever-young, and though mortality is the fate of mortals, his story is told to this day, thanks to St. Patrick. I just love your posts about fairy tales and myths. I’ve never spent much time with them, but I always want to after reading your posts. Your passion shines through. Thanks, Rosi. For me, it’s not only a love of the old stories, but a curiosity about current events. What are the deeper themes or fantasies behind the newspaper headlines? The Selkie tales also come from Orkney. I have a fondness for this sort of story, animal bride /bridegroom. Especially the swan maidens and Selkie /silkie. Have you read Midori Snyder’s essay on the Swan maiden’s feathered robe? http://www.midorisnyder.com/essays/the-swan-maidens-feathered-robe.html Once again, thanks for your thoughts. Thanks for stopping by, and thanks for your comments. Your sculpture project sounds great!